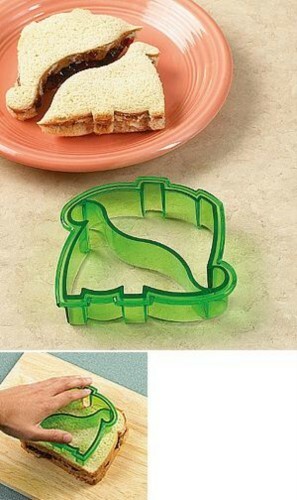 Removes crust as it cuts two dinos!! Mustard or mayo on that T-Rex sandwich? Your little dinosaur fan will flip over this DynoBytes™ crust cutter. In one press, it trims the edges, halves the sandwich, and creates fun tyrannosaurus shapes. Great for your little carnivore or herbivore – it makes ‘em ravenous for everything from ham and cheese on rye to peanut butter & jelly on white. Top-shelf dishwasher-safe plastic; about 4-1/2"W x 4-1/2"L x 1-3/8"H.